This month I have a guest reviewer. It’s Max, my 12-year-old son, who was thrilled to see a new book by D.J. MacHale. That’s the first sentence of D.J. 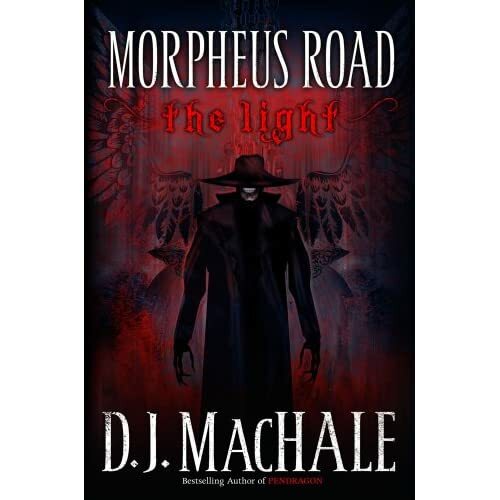 MacHale’s riveting fantasy novel, Morpheus Road: The Light. It’s taken some convincing, but after I read the book, I’m starting to believe it too. Marshall Seaver is expected to have the time of his life, home alone while his dad is on a business trip in Las Vegas. This 16 year-old, finds this out in ways that he never expected. The knocks on his bedroom wall, the signs he sees formed in spilled cat food. He feels these are all messages; signs that someone is in his house. Right before his eyes, Marshall discovers that his imaginary character, Gravedigger, has come to life. His job is to capture Marshall. To add to the endless suspense, Marshall’s best friend, Cooper Fooley, get’s into some serious trouble and disappears. With an outcome only D.J. MacHale can describe, Marshall sets off on an immensely scary, heart-pounding journey, to find his best friend. If only he knew how much this disappearance was connected to him. Those who love the Pendragon series, will like this story, because of the same style of writing. Though, I would have to say that this book is unlike many of the Pendragon stories because of the mystery and the horror in Morpheus Road. Yet the stories are similar because of the cluelessness of the characters that develops throughout the books. Have you every come face to face with a sentence in a book that makes you want to scream in terror? If you read this story you will live these exact words. MacHale’s words slide into the malicious, bony smile of Gravedigger. The dark brim of his hat lowering just beneath his skeletal eyes. A black cloak engulfing his body, while in his hands, is a silver pick, used in cemeteries, to raise dirt from the ground. You feel as if he is staring you down, and is locating his next victim. The hairs on your neck stand up, while a prickle runs through your spine. D.J. MacHale creates the perfect imagery, of a character that resembles death. Gravedigger wants something with Marshall. He wants him to walk the road. Morpheus Road: The Light will be released in mid-April. Review copy provided by the publisher. I haven't read the Pendragon series. But I will be reading Morpheus, thanks to this great review. I love mystery and horror.